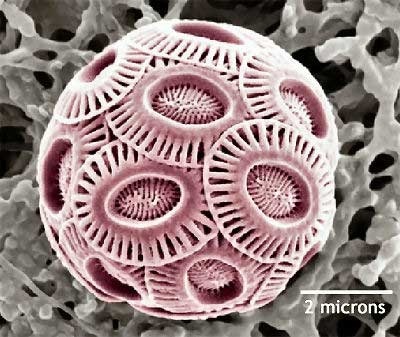 Before you ask, the picture shows the shell of a coccolithophore, and it’s in trouble. We’ve been adding a lot of carbon dioxide to the atmosphere, and a good chunk of it has ended up in the oceans. The water is getting more acidic, and some sea creatures are finding it harder to build their shells – which has the potential to disrupt the entire oceanic food web. We know it’s a problem, we know it’s happening, but we didn’t expect it be happening as fast as a recent research programme has found [Herald, Telegraph]. According to one of the scientists involved, “the coastal ocean acidification train has left the station, and there’s not much we can do to derail it.” Another excellent reason to cut carbon emissions, if one was needed. More on methane: research on a rapid release of methane hydrates 635 million years ago hints that modern warming could trigger a similar cascade of gas release, with catastrophic results for the planet’s climate [Science Daily News, Wired]. Wired also has an excellent backgrounder on methane hydrates, discussing how they might be turned into a source of energy, while the BBC reports that the recent rise in methane in the atmosphere looks as though it is coming from thawing wetlands in the Arctic. In better news, NZ scientists have completed deciphering the genome of one of the methanogens that live in the rumens of cattle and sheep (Stuff, Yahoo/xtra). With luck and a lot of hard work, this might lead to methods of cutting methane emissions from livestock, and eventually play a key role in reducing agricultural emissions around the world. Some light reading for the weekend: Yale’s environment360 is a new web site from the Yale School of Forestry & Environmental Studies, launched this month with some interesting and challenging articles from writers like Elizabeth Kolbert, Bill McKibben, and Fred Pearce amongst others. Worth checking out. For those with more than a few minutes to spare, I can recommend The Economics of Ecosystems and Biodiversity review [PDF] released this week. It’s an attempt to put a rational value on the services nature provides, to allow a Stern Review-type of cost benefit analysis of losing or retaining biodiversity [Herald, BBC, Guardian]. Climate change is only one contributor to biodiversity loss, but it could rapidly become the most important, and it’s the world’s poor that will suffer most. Oh come on Gareth, carbon dioxide is a food..
Come on, enough of your science, it’s far better to bury your head ;). Say what? Upwelling deep water is acidified? Reading the article they say it’s 50-year old water, so it’s not the thousand year old stuff right at the bottom, but that’s still fairly shocking! Someone really needs to get a handle on where that water came from and how it moved about. Does anyone know if any of the regular ocean monitoring (e.g. ARGO, ship-based research and the like) tests acidity? Re: CO2 as fertiliser: Let them eat grass. The acidification thing is a huge concern, because we base most of our assumptions on reducing emissions and stabilising atmospheric composition on continued absorption f CO2 by the biosphere and oceans. If the ocean is so sensitive in critical areas, then we have a very big problem indeed. You should be able to track down the paper via the Science Daily link – first one in that paragraph. I don’t know enough about oceanography to be able to hazard a guess. This looks like the one. I don’t know much about oceanography either, but I’ll see if I can get anything out of it. Hmmm, on first pass I’m not sure that it means much for ocean uptake of CO2. As far as I can gather the acidity of the ocean increases with depth, leading to horizons below which calcium minerals can’t persist. They’re discussing the aragonite horizon, which is apparently known to be the shallowest in the eastern Pacific, and where seasonal wind-driven upwelling brings the horizon closest to the surface. So much is normal, what’s different is that the horizon has become shallower due to anthropogenic CO2 caused acidification, to the point where it’s come to the surface in one location. I don’t see that this necessarily changes the overall ocean uptake rates, though. It’s not saying that the oceans are becoming saturated, but that certain acidity-related gradients are getting shallower. Consequences for marine ecosystems are another thing though. Feely et al say “These results indicate that the upwelling process caused the entire water column shoreward of the 50 m bottom contour to become undersaturated with respect to aragonite, a condition that was not predicted to occur in open-ocean surface waters until 2050,” citing Orr et al., Nature 437, 681 (2005) for that prediction… whether Orr considered the specifics of this study area for that prediction I don’t know. Feely et al go on to mention a number of marine species, including commercially important ones like salmon and shellfish, that some research has suggested may be negatively affected like this. They finish by saying “Other continental shelf regions may also be impacted where anthropogenic CO2-enriched water is being upwelled onto the shelf.” I wonder if we’ve got any of those here? Don’t quote me on any of this… I’m just trying to flex my ability to comprehend this stuff. Thanks, f. Interesting. The ecosystem impacts of acidification are scary in their own right, whatever the implication for atmospheric CO2. erk: Gareth are you really supporting GM sheep and cattle to solve the methane problems? “Deciphering the genome” does not equal genetic modification. It’s a first step to understanding how the microbes (methanogens) in the rumen go about turning grass by-products into methane. If we know how they go about it, then we might be able to use a feed additive to block that process. No need to modify the genetic make-up of either cow or bug. I’m not supporting genetic modification per se, but I am extremely supportive of genetic understanding! ah – just read their press release. interesting. http://www.ncar.ucar.edu/research/assets/Holland_AMS_Jan_2007.pdf See page 2, second graph, where wind changes there cause Hurricane Statistics that seem to proceed in discrete “regimes”. With regards the BBC article on Methane emissions and NOAA saying the evidence points to wetlands. NOAA didn’t really detail their reasoning, and I can’t find it anywhere else. But I’m fairly sure that the 13C/12C signature described in the BBC article is also what one would expect to see with continental shelf clathrate outgassing, as well as permafrost thaw / wetlands. That said, amongst all this I find one ray of hope. IMHO David Archer makes a convincing case that although CH4 release may be rapid geologically speaking, it’s unlikely to be catastrophic on a human timescale (decades-century). http://geosci.uchicago.edu/~archer/reprints/ Top paper on that page. Although given what’s happening in the Arctic, it seems to me that we’re now committed to a totally changed global climate, regardless of what we do. In 2005 Lyndsay & Zhang asked a question in their paper: “The Thinning of Arctic Sea Ice, 1988â€“2003: Have We Passed a Tipping Point?” As far as I’m concerned the answer is now “Yes”. I fear we’ll find it quite typical that we won’t know we’re crossing the tipping points to come until afterwards. Hmm, yeah, I recall seeing the “less absorption in the Southern Ocean” thing before but hadn’t really paid attention to the mechanism. It would be interesting to find a more detailed picture of ocean circulation and carbon fluxes between the surface and the deep. I know modern GCMs model oceans, but most of the discussion I see seems to focus on changes in atmospheric circulation rather than oceanic (apart from the gulf stream, that it). I suspect we’ll know more about the Arctic tipping point idea come ice minimum in September. Already NSIDC has extent as low as last year, and we know the ice is thinner… but there must still be a big chunk of unpredictability in there. In the southern ocean the wind goes clockwise around Antarctica. This wind creates a current in the ocean, which gets strong because there’s in effect an unimpeded channel around antarctica (can’t recall the name). Ekman transport produces a divergence to the left of the wind flow in the southern hemisphere (to the right in the north). So around antarctica there’s a net flow away from the continent. This net outward flow draws up abyssal water, which is rich in CO2 (due to centuries/millenia of decomposing biological matter in the deeps). So because there’s more CO2 in the ocean in that region net uptake of atmospheric CO2 reduces. Most of the ocean circulation is actually driven by wind circulation (e.g. Wunsch), it was recognised long ago that thermohaline circulation could not in itself drive global ocean criculation, although it plays a key local role in pumping surface waters into the abyssal deeps. In this respect I find it best to conceptualise the oceans as a bulk mass of water with various different local processes contributing locally to overall mass movement. Not as overall flows per se. Despite my thinking we’re in the midst of a rapid transition to a seasonally ice free regime in the Arctic, I still see enough uncertainty not to be sure about what will have happened by September. That said, regardless of what area/extent do, a more detailed analysis will show the ice cap in a worse state by minima this year than has previously been seen. On balance I think Gareth and the others are likely to win their bet. I now think even weather will not prevent a drop to at least last year’s extent/area. The most likely reason I can see for them to lose the bet will be because they’re betting on extent, not area. I suspect area could go down substantially whilst extent doesn’t, because extent is simply the area with >85% ice, whereas area is a weighted sum of areas with >85% ice, last year this difference lead to a million km^2 difference between extent and area. If the ice fragments, extent may not drop as much as one may expect. NOT 85%, SHOULD BE 15%. My mention of an unimpeded channel should have been a referrence to Drakes Passage, which opened in the miocene and allowed the formation of the Antarctic Circumpolar Current. Toggweiler’s paper (pdf) is here: http://npg.nature.com/nature/journal/v451/n7176/pdf/nature06590.pdf and it’s well worth reading! All this about the Arctic Cobblyworlds, but what about the Antarctic? Record ice extent last year – and this year running 1 million square kilometers more! And temperature? The UAH and RSS have just recorded the lowest May temp on record – inline with a fall since 2008 began. What’s happened to your CO2=warming theory? Ten years of no accelerated warming – despite accelerated CO2 release. HadCruT will show a 2008 temp anomaly of 0.3 (or even less!) after seven years of 0.4 (flat). The idea of CO2-induced climate change is falling apart Cobblyworlds, and I’m really enjoying watching it – and any effects from a spotless sun haven’t even kicked in yet. New post on sea ice and betting coming soon. Meanwhile, Harry, have you noticed that Antarctica’s a long way from the North Pole (as far as it’s possible to get). It’s a large high continent surrounded by a huge cold sea. The Arctic isn’t. Yeah, I kind of did know that. Is it only the Arctic you want to talk about then? Is talk on the Antarctic banned? Would that be because it isn’t conforming to the global warming scare? The point of my contribution was that (although) Arctic ice is less than we might wish it to be, the Antarctic is ever-growing. And by the way, we still don’t know if the Arctic ice extent will dip. Common sense says it will because the ice that re-formed is thin. However, since when has common sense played any part in the scare over cliamte change? It was at this point last year that ice extent fell rapidly. Oh, and ten years of 0.4 flattened HADCruT isn’t weather either Gareth. Expect 2008 to be 0.3 – and further falls to come in the years ahead. We sceptics see panic in the warming camp – and it’s so amusing. No, discussion of Antarctica is not banned, but what’s happening down there (here, actually, since we’re pretty close) is of no relevance to what’s happening in the Arctic. 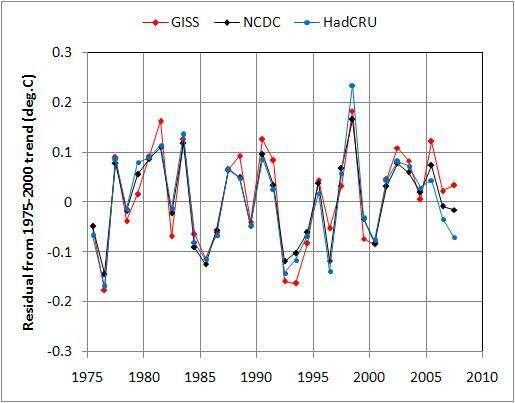 This RealClimate post explains why. And the Antarctic ice cap is not “ever-growing” – it’s losing mass, according to GRACE measurements. If “CO2=warming” is falling to bits, then there’s a hell of a lot of basic physics going to need re-writing. Care to explain how? First off, that realclimate link has been throughly laughed at – did you not know? basically, it’s realclimate’s “Anything that happens is in-line with models”. Yes! As for the physics, well of course you’re forgetting the #1 rule in climate change: If the models don’t fit the reality, the reality is wrong. That is, after all, what is happening to the temperature over the tropics. Models predict rapid warming here, but it’s ten times slower than it should be. Oh dear, what can possibly be wrong? Care to explain how CO2=warming if the actual experiment isn’t performing? I might strongly suggest you read-up on tropospheric warming over the tropics. It has realclimate scratching around for an explanation. Oh dear, Harry, wherever you lay your hat, it seems to be some strange parallel universe where you can ignore the facts, confuse sea ice with ice cap mass, and misunderstand the real state of play in tropical tropospheric warming. And oh dear Gareth, you don’t seem to be able to read a reply – though admittedly I did have to re-type it. My point on GRACE is that it is only six years old, and sea ice extent is at an all-time record high. FYI: “Ice cap” refers to the total area of ice, not just land-based. The interior however is also building, due to higher precipitation (as your realclimate link points out). Indeed, a report out last year made an incidental reference to a slower-spinning Earth due to the added weight. But like I said, you’re showing your ignorance, and that’s for you. And tropo warming? Well if you can’t see the wood for the trees that’s for you and you alone. I’ll leave you with your reading-up. I’m certainly not going to write out a full explanation here to make it easy for you. When you’ve read-up on ‘200 hPa Tropical’ at the Hadley site, come back and try and explain it. I’ll pop back in a week or two and see what you say; it will be interesting to see how you justify it. Cheers for the exchange, it’s been a educ…oh no, it hasn’t has it? Re: ice cap: Harry, you’re wrong. And, as it happens, so was I. The ice sheets on Antarctica (the land-based ice) are not growing, they’re losing mass. Just like Greenland. If it’s an ignorance parade you’re organising, I’d have to say you’re in the lead. Oh God! Here we go again! The Antarctic is irrelevant, it’s change is not statistically significant. The Arctic is significant, a 25% drop is statistically significant. Furthermore, given that the Antarctic is land surrounded by sea, and the Arctic is sea surrounded by land only a complete buffon would expect the same behaviour. What might increase precipitation (snowfall)? Increased water vapour content due to clausius clapeyron – due to warming. You may have read the words 200hpa over at the Hadley Centre’s site. But science is about comprehension, not just reading words. Harry, I bugged out of the Science Forums to let you troll there unimpeded, and allow me the time to get something productive done. It seems Simeon followed shortly after, so that you and your mates could have a little place to live out your fantasy. Can’t you have the basic decency and good grace to stop following me around cyber-space? Did you get that, “GAIN”? Go here http://www.arctic.atmos.uiuc.edu/cryosphere where even you’ll see the graph of the past 30 years. Everyone knows that the Antarctic has been getting cooler for 56 years, realclimate say the past 22 years, that the overall ice sheet is growing, and that it is in-line with model predictions – due to precipitation. Now Gareth, please stop showing yourself up, and drop the abusive terms like “cranks”. Can you conduct a conversation without abuse? Being sarcastic is fine, but please drop the name-calling, eh? Cobblyworlds. First off, I’m certainly not following you around!!! I was reading this site and saw your name. I haven’t contributed on ANY site that you have since the Science Forums. Science is about discovering the truth through idea and experiment. The Hadley data on tropic tropo is just great. It shows that models have got it completely wrong. Cobblyworlds. I’m a bit busy to discuss the Arctic, but you do know that we’re only going back to what it was between the turn of the 19th century and the early 1930s. What’s the worry? We’ve been here before, it’s just that back then we didn’t have news crews in helicopters shwoing the lack of ice. The net loss in volume and hence sea level contribution of the Greenland Ice Sheet (GIS) has doubled in recent years from 90 to 220 cubic kilometers/year has been noted recently (Rignot and Kanagaratnam, 2007). Okay, I give up. If you don’t want to learn, then that’s fine. I thought you did. My mistake. Harry’s been studying at Eli’s school of climate trolling. How very grown up, dismiss someone who doesn’t agree with your views as a “troll”? How poor. If you cannot substantiate your claims with adequate references (as Cobblyworlds knows I can, because I always quote Hadley, CRU, UAH and RSS) then fire snide comments instead. I have quoted government-run sources and respected institutions. You have made reference to a group of self-indulgent individuals who have a website, and made rather silly comments. Who’s the troll? You can’t corroborate anything because you lack context and comprehension. I’d rather learn from professional scientists than the internet equivalent of some bloke down the pub. I’m to busy to feed you, and I’m not interested in crossing to the other meadow. The grass over here is quite green enough. I’ll desist now, you have my email. Cobblyworlds, you and I (and everyone on the Science Forums) know that you always bow out when you cannot substantiate your claims. And you always make the same excuse. Fact is, you like to promote your theories on sites such as this, then run when someone questions what you say – you do it every time! To say I can’t corroborate anything did make me smile – thanks for that. As I always quote Hadley, CRU, UAH and RSS then I’ll let those august organisations speak for themselves. Please note that these are the very organisations who provide the figures on which the whole of the IPCC data is presented. If the data is flawed then you might want to take it up with them, or change your theories (as I did. Remember I was a Warmist just like you). …in the sense that there’s a huge megaphone incessantly blaring the same talking points over and over again. It’s like printing 1,000 photographs of a single papercut and then saying that it’s really 1,000 papercuts. If GW had stopped there’d be an increasing deviation between the trend-line and observations. If someone shows me wrong I thank them and reappraise my opinion with the benefit of the new evidence. I walk away from timewasters. Having read much of the IPCC’s Third Assesent Report, I decided that the best way to address my doubts about what was to become my “former” scepticism, was to ask questions of sceptics and their opponents. So I asked about an issue connected with Water Vapour (“More BBC Scaremongering”, 31 January 2005 12:18pm just my 37th post). “Harry G****tt” (aka Harry the Hat) long known as a denialist on that board, asserted there was no tropospheric warming, computer models were “worthless” and that water vapour feedback was not happening. He also perjoratively accused me of having “faith” in the IPCC because I had the temerity to say that “having read the technical background of the IPCC report” and appreciating the quality of their work, I would “defer to their expertise”. But surely, CobblyWorlds, the evidence for global cooling is growing! Look, as evidence, we now have yet another copy of the same talking point! Surely that counts as additional evidence! You’re quite right Bi, why did I bother studying Electronics at University? I could have just gone down the pub and asked my mates. 1. There is no tropospheric warming that would indicate that CO2 is responsible for the observed land & ocean warming – still. 2. Climate computer models are indeed worthless – still. 3. You only get a positive water vapour feedback amplifying warming if the troposphere warms. The wv generated by surface warming cannot make it to the dry upper atmosphere. If it did then we would have had runaway warming from just about any event that caused initial warming. But we don’t. The climate isn’t that sensitive, and has checks and balances. So, no water vapour feedback isn’t happening – still. There, how’s that. Do you still hold theories as true that you had a few years ago? Bet not! And yes, I was a Warmist – even a member of Greenpeace actually. It was 2001/2 when I saw the light, that the theories just don’t stack up against reality. Having a theory is great, and having models is just brill. But what do you do if those theories and models just don’t accurately show what’s happening? Over on the Science Forums I asked you at what point you’d worry that something was wrong with your ideas. You steadfastly refused to answer, because this has become a religion for you. Even when I informed you that your beloved Gavin Schmidt had put a 5-year date on it, you accused me of fabricating that. When another contributor actually pasted Gavin Schmidt’s words (exactly as I had stated) you refused to take any further part in the discussion, didn’t apologise, and flounced off the forum. But then that’s what you do, isn’t it Cobblyworlds? “By 2015, the expected temperature from the regression-line fit and that expected from the â€œno changeâ€ hypothesis will be far enough apart that weâ€™ll probably be able to distinguish between them with statistical significance. In other words, by 2015 either weâ€™ll know that global warming has changed (possibly stopping, possibly reversing), or thereâ€™ll be no more of this â€œglobal warming stopped in 1998â€³ malarkey. Itâ€™s entirely possible that the numbers may give us statistically significant evidence even before 2015. If so, Iâ€™ll report the result. If it turns out that global warming is not continuing (which I seriously doubt), then Iâ€™ll readily admit that I was wrong. In fact, Iâ€™ll be keeping a close eye on the future evolution of global temperature and actively looking for such results, so if we do get valid evidence that global warming has stopped, I just might be the *first* one to say so. If 2015 rolls around, and temperature have risen above present-day levels by enough to be demonstrably significant, Iâ€™ll announce that too. Harry, the incomprehension is strong in you, but I will grant that you come up with some new twists on the old talking points. So, good marks for creativity and persistence, but a fail for everything else. Gareth. Would you be so kind as to point out what you feel is my ‘incomprehension’. Thank you. Harry, please go and read The Discovery Of Global Warming (link’s in the blogroll above). It covers the basics of climate science and its development. Gareth. That doesn’t address my point – and you know it. What specifically do you think I don’t comprehend? I’ve been contributing to CC forums for seven years, btw. It’s a sign of belief when ideas remain unchanged, and a sign of a belief driven viewpoint when such lack of change is viewed as a good thing. My ideas have changed radically in the last 5 years as I have learnt. 1. The troposphere is warming, the Stratosphere (and crucially mesosphere) are cooling. That’s a fingerprint of CO2’s enhanced greenhouse effect. 2. Too daft to bother with. 3. The powerful positive feedback of ice feedback hasn’t left the Arctic free of ice. So why should WV feedback bake the planet? WV feedback has been shown in studies of events like the eruption of Pinatubo. It acts to amplify cooling as well as warming such is the nature of +ve feedback. If that puzzles you, then you need to go learn. WV feedback is working now around you, it will keep you warmer than you’d otherwise be at night – ever wondered why subtropical deserts get cold at night? It’s a lack of water vapour, hence a reduced greenhouse effect on a local basis. If you remember I strolled away after more of your nonsense about the arctic. You haven’t been “contributing” for seven years, you’ve been in a loop with fixed ideas. I will leave you to it. Very sorry for attracting this nut. Harry, read the material, review your points above, and then come back to argue about the science. Cobblyworlds. There is no need to resort to name-calling. It adds nothing to the debate, and makes your points rather worthless. I do think it’s a great shame that people cannot discuss something without resorting to abuse. You know you always do this and I always berate you for it. The troposphere isn’t warming in-line with the idea of CO2-induced warming. At the tropics it is supposed to be 1.5 times the surface. In fact, it’s negative. The stratosphere did begin to cool, but hasn’t now for some years, so why do you persist in this when you know it isn’t true? Odd. As I said, we only get a positive water vapour feedback amplifying warming if the troposphere warms – which it isn’t (or rather not enough). Gareth, that’s still not an answer – be specific. For the third time then, what specifically do you think I donâ€™t comprehend? Harry, I have no intention of getting involved in a long and tedious exchange with someone who demonstrates – how shall I put this – a rather partial take on what the science actually says. Your three points above are all wrong. If you don’t know why, you can start by reading the reference I provided. Do you say that the troposphere is warming in-line with models? Remember what I said about the tropo above the tropics. So, answer please. Thank you. Yes, thank you Cobblyworlds, I’m sure you realise (as I read realclimate and occasionally see you there) I’m well aware of their take – and their error bars. Do you want to take part in this discussion then, or am I too nutty? Traditionally, here in England we’ve always called June ‘Flaming June’. Most years it’s hot. However, this year it’s most definitely not. I’m not saying we’re shivering, but just to put it into perspective tonight it will apparently drop to single digits celcius – and we’re halfway through the month! Incidental stuff, of course. But then I happened to catch the US weather across the country coast to coast, and noted that they too are calling it Chilly June this year. Also in the news here is the fact that the Irish have voted No to ratifying the European Treaty. Fantastic news for all us anti-Euros. But then I caught a euro-crat on our national radio news saying that it doesn’t change much. Absurd folly. And I cannot help but equate it with what’s going on with the climate. I know that low temps being recorded across the globe, record snow falls and snow in places that have never experienced it, as well as extrremely low temps in the troposphere, mean only ‘weather’. But when it’s been the other way then we sceptics have had to sit cross-armed and take a brow-beating on global warming. Well now it’s your turn, and I believe I smell fear in the Warmist’s camp. There’s certainly back-peddling going on, with talk of wide error bars, and things being consistent with models (yes, if you apply ridiculously-loaded parameters). We’re currently waiting for the HadCRUT May figure – and we know it’s going to be low, perhaps even 0.15 It will mean ten years of no accelerated warming. Tropospheric temperatures have nosedived, with the tropic temp going negative. And of course, we’re waiting still for Solar Cycle 24 to start in earnest. Still a spotless sun as I write. The longer it goes on the more likely it will portend a cooling. And yet the Warmists go on as if nothing is happening – even though CO2 continues to fail at dragging global temp upward, and I’m reminded of those Eurofools who want to pretend that the Irish (the only Europeans given the vote) didn’t really vote No. Quite simply, the world isn’t warming anything like you, or your models, thought it would. Gareth. You’d rather not answer then. That speaks volumes. I don’t think you have the intellectual capability to discuss the issue, frankly. Reading the other threads here, and what’s being said, I can only come to the conclusion that you are all burying your heads in the sand and making out that warming is continuing. Some of the comments are really very amusing. I’ll leave you all to it. No, Harry, just an unwillingness to waste my time. Well try as I might I cannot see Gareth’s reasoning here. That is to say I see nothing wrong in what harry is saying, unless I have my thinking on climate science wrong. I also cannot fault his 3 points that Gareth says are “wrong”. Carbon dioxide increase causes positive feedback of increased water vapour, doesn’t it? And therefore run away warming. But we aren’t getting run away warming and real climate say we won’t. Added to this is the news from NOAA that atmospheric water vapor is at an all-time low. Doesn’t this too put a fly in the soup of global warming theory?